I’ve been a big fan of Javier Perianes’ work on record so far, but this disc feels like a bit of a misfire. Schubert’s final sonata is, for me, perhaps the greatest thing ever written for a solo piano, but Perianes’ hasn’t attained the depths that a really great interpretation needs. There are definitely some good things. For example, I like the way he emphasises the dark rumbling in the bass that does so much to undermine the progress of the whole first movement, and he includes the exposition repeat, which allows him to plumb its depths still further. Furthermore, the exposition repeat sounds much more together and, for want of a better word, orthodox than it does the first time around, almost as though the music has managed to capture its composure after initial discomfiture. Likewise, the development section has a searching, probing quality to it, and while the recapitulation seems a bit more settled than the exposition, Perianes also has a knack of making that peace sound superficial. The gentle chords which bring the movement to an end seem to hint at dark depths that lurk just beneath the surface. Elsewhere, however, his technique lets him down. Flexibility of the beat is an important part of the pianist’s artistry, but it feels as though Perianes is trying to make something out of it without having really thought it through. The very first chord, for example, sounds a little detached from the rest of the main theme as it unfolds, and there doesn’t really seem to be much of a reason for it. Likewise, as he introduces the second subject, there is constant pushing forward and pulling back. That emphasises the ebb and flow, but it can become a little intrusive and there's sometimes a sense that the two hands are looking for but not quite finding one another. Even more damagingly, there’s a staccato quality to the slow movement that I just didn’t like, making its profound utterances sound rather detached, even a little cursory. The central section, too, sounds a little rushed in places. The turn into the major at 6:45, one of the most profound moments in all of Schubert’s keyboard music, just comes and goes without much impact. There is a pleasing air of brightness to the Scherzo, on the other hand, and he gets the balance of seriousness and lightness in the finale. However, the recording feels like he has set down his interpretation too soon, whereas it needed a bit longer to mull over. 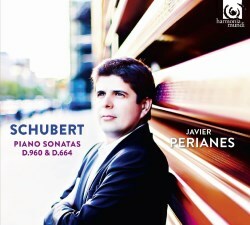 Age isn’t a barrier to attempting it, of course: after all, Perianes is older now than Schubert was when he wrote it. Some more experience with it will do him good, though, and I hope he’ll want to come back to it again in future. For years my touchstone for this great work has been Leif Ove Andsnes, a master who becomes a poet when he plays this music, and who has clearly thought carefully about every note. His tempo relations and dynamic choices seem just right to me, where Perianes still seems to be finding his way. His is a relevant contribution to the debate over this great sonata, but he has a way to go before he finds something more profound and personal to say. He is better with the earlier A major sonata. The song-like simplicity of the opening is delightful. It’s much more superficially gemütlich, and Perianes seems to trip his ways through the music with greater assurance. There is directness and lack of affectation about his playing of the lovely slow movement, which seems to tap into the music’s heart rather than skipping over something important (as he seems to in D960). His unhurried approach here seems just right, delicately picking his way through the music’s path and finding unexpected depths on the way, and there is a delicate, dancelike quality to the finale which his very fitting, and is brought to life most appealingly. One final observation: these two sonatas make rather odd bedfellows! Hearing them alongside one another is a slightly strange experience which may bring out new things for some but which, to me, spoke of slightly unwise programming. Others will, doubtless, disagree.